ObjectRocket sharded instances implement standard MongoDB sharding, but hides the complexity of all the components into an easy to use service. The standard components are all automatically provisioned by our systems on demand. The MongoDB balancer is used to keep data between shards at an even level. For more information about the MongoDB sharding architecture check out MongoDB’s official sharding introduction. Choosing the proper shard key is critical to performance and scalability. MongoDB Inc. has written a great primer, but our DBA’s would be happy to help as well! Defining shard keys manually is performed via the ObjectRocket control panel. This is done for existing collections on an individual basis by navigating to the instance, database, then collection and selecting the shard key tab. Click the add shard key button to define the key. 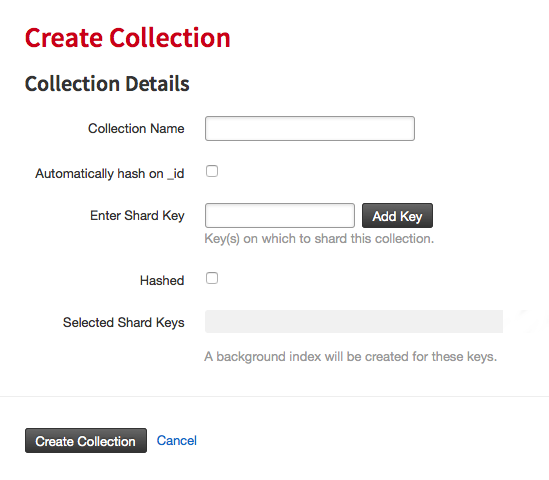 When new collections are made you have the option to define a shard key during that process as well. 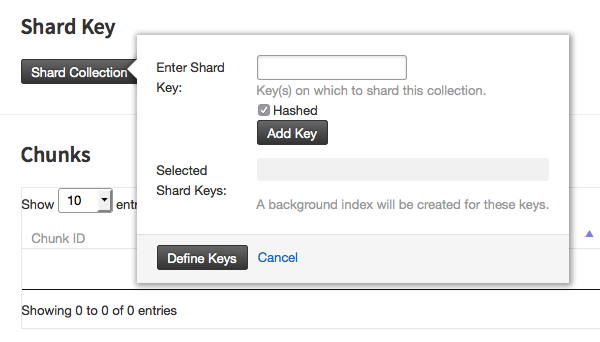 Our platform can help automate the creation of shard keys on MongoDB 2.4 and up using a feature named AutoKey. Autokey watches each and every MongoDB instance, and when the criteria is met for adding keys, the agent creates and applies the shard key. This setting gives true ‘set and forget’ sharding capabilities. The potential downside is a hashed shard key on _id may not be optimal in every case. AutoKey in the settings must be set to ON. The collection has more than 256MB of data. The collection doesn’t already have a shard key. ObjectRocket built our MongoDB platform with scalability in mind, right alongside performance as they often go hand in hand. This means it’s simple to scale no matter what instance you build! Sharded instances can simply add an additional shard letting them scale horizontally, and then the balancer moves some of the existing data to this new shard giving more compute and storage to the cluster. Shards can seamlessly be added to an instance at any time. 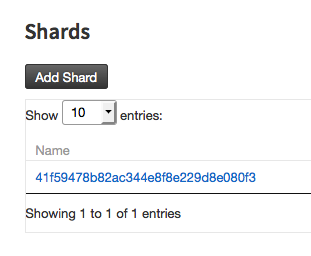 To add a shard click the Add Shard button on the Instance Details page. This will add a shard in the current plan size of the instance. If you don’t want to manage adding shards manually, you can enable RocketScale, described below. All Replica Set instances as of April 4th 2016 will allow for automatic scalling in increments of 5GB. Under the Instance Settings page you can have an email sent when the space usage reaches a certain percentage, allowing you to review before more space is added by our system automatically. RocketScale is an agent unique to ObjectRocket that scales sharded instances in an automated fashion as the instance grows. RocketScale watches each MongoDB instance, and when RocketScale threshold on the settings page is exceeded it adds a shard to the instance. The RocketScale threshold is based on total percentage of storage consumed on the cluster. The current storage usage is viewable on Instance Details by clicking the instance name on the Instances page. For example, if the plan is 20GB, and there are currently 2 shards for a total available storage space of 40GB, and Rocketscale is set to 75%, then when the storage usage reaches 30GB a shard will be added. RocketScale may be turned off by setting it to zero or removing any value from the field on the settings page. ObjectRocket utilizes the MongoDB Inc balancer. The balancer by default is in the ON state. If the balancer is impacting performance it can be turned OFF or alternatively, daily windows can be defined for when the balancer may run. Defining balancer windows is done in the control panel under the settings section on the Instance Details page. In general it’s not recommended to turn the balancer off, as this can effect the ability of the system to scale properly when you have more than one shard. The Instance Details page in the control panel shows the current balance of the cluster by percentage of total. The balancer status is also viewable on the instance settings page, and is either Stopped or Running.